When we started working with Mackintosh, their website was a mess organizationally and graphically. It felt immature, and Mackintosh was ready to really up their game. 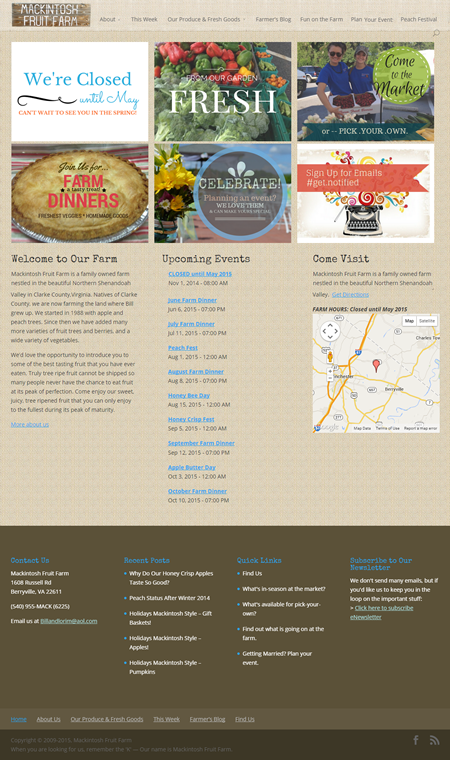 We were excited to work with them to create a site that reflected the beauty of their farm and the fun that you could have there. Because Mackintosh Fruit Farm wanted to post content and events on a regular basis in-season, we built a dynamic website using a popular content management system. This is a perfect way to make it easy for the farmer to publish his articles and the team to post various content about in-season offerings and upcoming events. We started with a great pre-existing theme as our foundation and customized it to make their website uniquely theirs. With a burlap background, it started to feel very elegant in a farm-sort-of-way. Farms can be hip, you know…so instead of the classic slider banner, we did some fun “ads” that highlight many of the great things the farm has to offer. Because they didn’t have a budget for a formal logo, we got creative and used a photo of the actual farm signage instead. Perfect! Now visitors will have instant recognition of it when they arrive. We love the results, and are super happy that they did, too!